Our LOYAL3 Shares Have Transferred – Now What? After waiting 40 days, my LOYAL3 transferred shares finally made it to our Fidelity brokerage account. While I always felt comfortable our shares would eventually transfer, I was getting a little frustrated not having access to them. 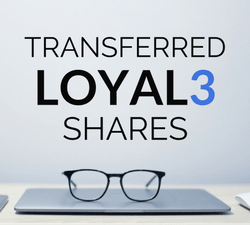 When LOYAL3 announced they were closing down, account holders had 3 options for their assets – take no action and let their assets transfer to a new FolioFirst account, sell shares and transfer cash to a bank account, or transfer assets to a different broker. We picked the last option and immediately submitted a transfer of our LOYAL3 assets to an existing Fidelity account. This was the first time we decided to transfer shares between brokers. Despite the long wait (mostly because of LOYAL3), it was a very simple process. All we had to do was fill out a form with the broker we planned to transfer shares to (Fidelity) and they handled the rest. In this case, their were no associated fees with the transfer … but you need to make sure of any transfer fees before going through this process. Despite the disappointment of LOYAL3 closing down and missing out on zero commission trades, there are some benefits of consolidating brokerage accounts. Prior to LOYAL3 closing down … my wife and I had 6 different brokerage accounts from 5 different brokers. In addition, we also hold shares of stock with third party transfer agents – Computershare and AmStock. What is the reason for having so many different brokers? Over the years, it just sort of happened that way. We took advantage of several different offers for free commissions, etc. And after almost 10 years of investing, we ended up with several different accounts. Our goal was (and still is) to save on commissions and fees, so that we can invest as much of our funds as possible. So over the years … we just kept adding brokers. However, having so many different brokers can have its disadvantages. First of all, it makes keeping track of everything a little bit harder. For example, we owned shares of McDonald’s (MCD) and Intel (INTC) in both our LOYAL3 and Fidelity accounts. One of the brokers paid cash dividends (LOYAL3), the other had DRiP setup (Fidelity). At the end of the day, it doesn’t really matter that much for earning dividend income. But today it is certainly a nice feeling that our shares of MCD and INTC are all with the same broker. It also helps to have all our other LOYAL3 shares together with other stocks we own. Another benefit of consolidating brokers in this case are the account features offered by Fidelity that LOYAL3 didn’t … most notably – Dividend Reinvestment Plans (DRiP). What to Do With Our Transferred Shares? Now that our shares have successfully been transferred, there is one important step we must take. Since we are still in the process of building our dividend income portfolio, we like to setup dividend reinvestment plans (DRiP) for the majority of stocks we own. And since Fidelity offers DRiP, we plan to take advantage. So the last step of transferring our shares will be to setup DRiP for all of the companies that we transferred from LOYAL3 to Fidelity. This will allow us to add partial shares of stock from companies like – Apple (AAPL), Microsoft (MSFT), WalMart (WMT), Target (TGT), and more at no charge. Since LOYAL3 did not offer DRiP, we are looking forward to building our portfolio each time we get a dividend payment. For those skeptical of DRiP … consider this. My wife and I purchased 25 shares of Consolidate Edison (ED) back in the summer of 2008. In the 8+ years since this purchase, we have earned $677.61 in dividends … all of which have been reinvested into additional shares of the company. We have added 12.35 shares of ED from those dividends … which if sold today would be worth $1,032! That is how powerful using DRiP can be over the long term when investing in quality dividend stocks. Should We Transfer More Shares from Other Brokers? Now that we are almost finished with our LOYAL3 transfer (still waiting for $100+ cash to transfer to our bank account), we are wondering if we should consolidate additional accounts? The quick answer is – YES. There are no real advantages to keeping some of our stocks held in different accounts anymore. For example, we have 4 stocks in our Computershare account. Depending on the stock, we are now getting charged for dividend reinvestment. We recently turned off our Verzion Wireless (VZ) and ExxonMobil (XOM) dividend reinvestment’s to avoid high investment fee’s. Instead of reinvesting these dividends, we are getting a check in the mail. Those funds are then deposited and eventually recycled back into more shares of stock. But I would rather have them consolidated into our Fidelity account so they could take advantage of DRiP once again. We will likely take the next few weeks and decide how to better consolidate our existing accounts to take advantage of other broker account features and to make reporting simpler. Do you have more than one brokerage account? What are your reasons for holding stocks in multiple accounts? Full Disclosure – At the time of this writing, we owned shares in the following stocks noted in this post – AAPL, ED, INTC, MCD, TGT, WMT, VZ, and XOM. The material above is not a recommendation to buy. Please do your own research on a company before deciding to invest.